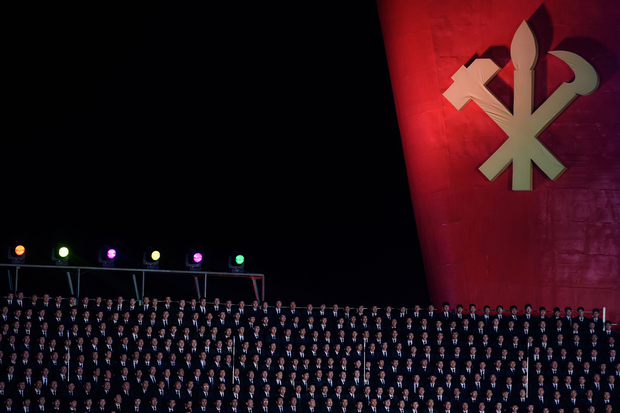 Performers sing before a backdrop during an open air dance and music performance on the North bank of the Taedong river in Pyongyang on October 11, 2015, during celebrations marking the 70th anniversary of its ruling Workers’ Party. In the 1950s the United States became obsessed with a burning question of extraordinary hubris: Who Lost China? No less nefarious a force in American political life than Senator Joseph McCarthy used this question as a sledgehammer to go off on his dark Quixotic quest for Communist agents lurking behind the windmills of Foggy Bottom. The careers of some of the Greatest Generation’s finest China hands were destroyed, and China studies and China policy suffered for decades as a result. The arrogance of that original question, implying as it did that it was one of ‘us’ Americans who ‘lost’ a country of hundreds of millions, opened the gates to the pathology of McCarthyism, predicated on the paranoid assumption that there must have been traitors in Washington who won China for Mao. Fortunately the United States learned the lesson of McCarthyism (although at moments in the GOP primary one has had to wonder if the lesson is sticking). But the original hubris embedded the idea that the world is ours to win or lose has been harder to overcome. The American foreign policy establishment’s worldview is at some level anchored in an idealist, and hubristic, notion that the entire world is converging on our form of government, our political values, and our way of life. And U.S. foreign policy often comes down to questions of when to push, when to nudge, and when to sit back and wait for the Great Convergence to take place before our eyes. No place has defied America’s Whiggish view of history quite like the Democratic People’s Republic of Korea. Almost alone, North Korea spits in the eye of teleology, defying the verities of liberalism, capitalism, globalization. It is one of the poorest and most isolated countries in the world, yet it has unlocked the secrets of the world’s most guarded technology—nuclear weaponry, launches satellites into orbit, and, according to our own intelligence czar, carried out the most successful hack in cyberhistory. It is the only ally of East Asia’s new great power, yet it treats Beijing with disdain. Even as it keeps China at bay, it jeers at American power in the Pacific, egging on the pivot almost as if missile defense and nuclear threats are precisely what it wants. What is wrong here? Why is history stuck in gear? The DPRK was supposed to fall with its patron, the Soviet Union, yet it endured. The Kim regime was supposed to collapse with the death of Kim Jong Il, yet it flourishes under his son. When will Pyongyang fold, and come knocking on the doors of the international community, tail between its legs, begging to be let in on any terms? When will this aberration, a Communist monarchy, wither away like it was supposed to? When will this problem go away? This is our new Who Lost China debate. Call it the Who Nuclearized North Korea? Was it Bill Clinton’s fault for naively negotiating the Agreed Framework directly with Pyongyang, South Korea’s liberal presidents for flooding North Korea with cash during the ‘Sunshine Policy’ decade, and Hu Jintao and Xi Jinping for refusing to pull the plug on Pyongyang today? So the sanctions hawks will say. Or was it George W. Bush’s mistake for trashing Clinton’s efforts and undermining Seoul’s engagement, followed by conservative South Korean president Lee Myung-bak’s confrontational tactics, and completed by the apathetic, inert approach of Barack Obama known as ‘strategic patience’? That’s what engagement doves (like me, sometimes) will say. Deep down, most sanctions hawks and engagement doves probably have doubts that their method will succeed. The only thing they are certain about is that the other way won’t work. Maybe we are both right. China policy got stuck in this kind of purgatory for the two decades after the Korean War (there’s a reason you’ve never heard of a great book on JFK and LBJ’s approach to the PRC). Our Who Lost China debate over the North Korean nuclear issue has dragged on long enough. It’s time for the Nixon in China moment. History is not a monorail. It’s a desert. We need to find an oasis. Thanks, John, for initiating a very rich and timely discussion. John appears to echo a common American worldview that looks at the North Korean issue under the canopy of America’s China policy. Under this frame, Washington in fact yields to the notion that North Korea belongs to the Chinese sphere of influence. Thus, when North Korea engineers trouble, Americans blame it on China. It’s like when a dog bites a man, the man blames it on the dog’s owner, not the dog. This mentality helps us to understand why the U.S. came up with the “China card” in dealing with North Korea. Washington “outsourced” the task of dealing with North Korea to China, by inviting the latter to host the Six Party Talks, a multilateral platform aimed at North Korea’s denuclearization. With that, the U.S. settled down in the back seat, while China was elbowed into the driver’s seat. Every time the car veered off course, the driver got scolded. The widespread “North Korea is China’s problem to fix” narrative is a brilliant piece of U.S. public diplomacy that warrants serious soul-searching, because relying on the tactic of buck-passing goes against the very spirit of what America stands for. America’s North Korea policy, dubbed “strategic patience,” is a convenient recipe for ignoring North Korea, while Washington points fingers at China. Washington has been avoiding negotiations with Pyongyang, delegating the task to Beijing. China sees it as unfair. It’s in fact up to America, not China, to show leadership. Doing so serves American national interest. It’s Biblical, too. Washington’s current policy is unpatriotic because it doesn’t serve American national interest. Globally speaking, America’s national interest has two pillars; one is to defend its current superpower status, the other is to safeguard its credibility. During his State of the Union address, Obama proclaimed: “When it comes to every important international issue, people of the world do not look to Beijing or Moscow to lead. They call us.” Obama was talking about American credibility. When people trust America and its leadership, America can continue its leading superpower status by sustaining the current global governance system, which it established and thus suits American interests. The world is watching how America deals with the North Korean challenge. America’s credibility and leadership is at stake. Washington’s current policy of outsourcing the challenge to China is un-Biblical. Sure, dealing with a regime like North Korea is a dirty business, requiring patience and long-term commitment. It could be domestically unpopular too. So, it’s not everyone’s challenge. It takes a special country. It takes special leadership. And that’s America. In the New Testament’s Galatians 6:9, it says: “Let us not become weary in doing good.” After two decades of frustrating, fruitless negotiations, Washington felt disgusted with the Pyongyang regime and humiliated for the very idea of sitting across the negotiating table with North Koreans. But it cannot outsource the challenge to a country like China. America should lead the way. America should go back to look at the North Korean conundrum by thinking more deeply about its long-term national interest and by going back to the teachings of the Bible. John Delury’s article is spot on to reveal the policy inconsistency of the United States in the handling of North Korea in the past decades. It has varied remarkably from the Bill Clinton Administration to the Obama Administration, switching course explicitly between “engagement doves” and “sanction hawks.” Thus Delury calls for a “Nixon in China moment”—an historic diplomatic episode echoing the 1972 visit that successfully reopened the door for U.S.-China cooperation and dramatically left behind decades of animosity and hostility between the two powers. Delury’s call is worth a try as no one can deny the reality that the lingering standoff of denuclearization on the Korea Peninsula actually urges Pyongyang to scale up its nuclear and missile programs to desperately uphold its regime’s survival. The apathetic and inert “strategic patience” approach of the Obama Administration has failed—North Korea exploded its fourth nuclear test on January 6, 2016, and launched its sixth long-range missile test on February 8. The “engagement doves” seem unable to alter North Korean behaviors and unlikely to dissolve Kim Jong-un’s motive to pursue nuclear weapons. Pyongyang’s imperviousness to diplomatic pressures and economic sanctions stems largely from its regime type—a vicious combination of personality cult, totalitarianism, and a “military first” domestic power structure. Kim Jong-un cares little about the suffering of his people, and instead attempts, as usual, to maintain his grip on power through nuclear desperation. There is little hope that North Korea will abandon its nuclear capability as long as the regime type remains unchanged. In addition, Kim Jong-un asks for international recognition of North Korea as a “nuclear status power,” a status few other powers in the world are willing to concede. “Engagement doves” are confident their path will alter North Korea’s regime type. Perhaps. But how patient are we as Pyongyang’s nuclear weapons pose a serious threat to the region? Furthermore, a calling for “Nixon in China” moment seems less desirable and applicable given domestic and security imperatives in the United States. A leading driver behind the call for a “Nixon in China” moment around North Korea is the modern day equivalent of Nixon’s “balancing the Soviet Union”-based security policy. Nixon acutely realized the value of the “China card” vis-à-vis Moscow early in the 1970s, while Mao also saw rapprochement with Washington could greatly beef up his anti-Soviet policy. Might the presidents of America and China now acknowledge a common enemy and seek together to turn North Korea with a “smiling offense” against Kim Jong-un? A new approach is absolutely needed between China and the U.S. when confronting Pyongyang’s nuclear and missile paranoids. An essential option is to conduct tougher sanctions to wither away North Korea’s potential to develop nuclear weapons in internationally coordinated and assured ways. Washington should stop scapegoating China for its failed North Korea policy and respect China’s wide-ranging security concerns in the Asia-Pacific. For the moment, suspending THAAD deployment talks between Washington and Seoul would be helpful. Beijing, equally stuck in North Korean purgatory for two decades, needs to end its indecision and think about completely cutting-off the supply of oil it sends to Pyongyang, following the mandate of a new United Nations Security Council resolution. When China and the U.S. decide together to adopt such a big stick, the international community should simultaneously take tougher sanctions more seriously. Washington needs to lower the threshold of diplomatic engagement, and even promise security guarantees to the Pyongyang regime as North Korea simply agrees to suspend the development of the nation’s nuclear capability. Smothering North Korea for its nuclear capability seems the only workable alternative. China and the United States should not line up to meet North Korea’s exorbitant demands, and instead should jointly make clear that keeping nuclear weapons would be deadly costly. North Korea’s continued bomb tests have apparently infuriated China, so why is Beijing still reluctant to react with harsh sanctions? China’s policy on North Korea reflects both its regional interests and global aspirations. There are two main aspects: first, China does not want to hurt or is not ready to abandon the traditional relationship and turn itself into an enemy of the DPRK. As a matter of fact, China has tried very hard to push a three- step dialogue, beginning with a consensus between the North and South, extending to a North Korea-U.S. dialogue, and then ending with a peaceful solution found in the Six Party Talks. China’s logic is that the DPRK will not give up its provocative acts unless it obtains a minimum security guarantee from the U.S. If all these positive steps cannot be achieved, then at least the head-on blow against the DPRK should not come from China directly. Secondly, any change of China’s North Korea policy should not be seen as a product of U.S.-China cooperation to put pressure on North Korea. Indeed, despite serious debates in China over whether North Korea is a strategic liability or an asset, many Chinese commentators are deeply concerned with military reactions by the U.S. and its allies in the region. The general perception that the U.S. spares no efforts to keep China, rather than North Korea, down is real among Chinese citizens and government officials. For instance, the U.S. overreacted by sending B-2s and B52s to participate in repeated military drills in the past. North Korea should be free of nuclear weapons but launching any regime-change strike against Pyongyang should not be the policy choice. Even a THAAD system in the region, in China's view, might compose a bigger challenge to regional security than did North Korea’s latest launch. The contest of will between North Korea and international community will continue but it is necessary for the U.S. and China to better comprehend each other’s policy limits and fashion some joint actions to help avoid conflicts and confrontations that neither side wants on the Korean Peninsula. It will not be easy to do it, since the U.S. seems to lose “strategic patience” on China as well. Without China’s cooperation, will the U.S. mobilize its allies and take unilateral military actions such as a surgical strike against the DPRK? It’s highly unlikely at this time. The question left for us to consider then is this: If relations between China and the U.S. over the last two decades can generally be characterized as a mix of broad contact, substantial cooperation, deep competition, and occasional confrontation, can these two countries launch another round of dialogue on the Korean issue to find a way of turning black clouds into silver linings? Perhaps neither side is ready yet. But without these two countries working together, a "forced choice" strategy putting new pressure for North Korea will not work alone. I think we can all agree on a few points: U.S. policies under successive Administrations of both parties have not worked. We cannot rely on China. We need a radically different approach. We should rule out a military attack (unless provoked militarily). We must reach consensus with South Korea and Japan, and at least keep in touch with China and Russia. Any proposed course will be very difficult and risky, but should be measured against the mounting dangers of North Korea’s nuclear and proliferation threats to the U.S. and allies and, I would add, the continuing crushing of the North Korean people. In this context, the implied recommendations that we engage North Korea with comprehensive offers deserve a respectful hearing, assuming they are coupled with serious threats, the “fork in the road” approach, and our allies are on board. But the arguments rest on some distorted history and flawed assumptions—I only have space to cover a few. We have not completely outsourced our policy. We have already offered continually to Pyongyang to negotiate all that it seeks, e.g. security guarantees, economic engagement, diplomatic relations, etc. We have done this bilaterally and multilaterally, in grand bargains and interim steps. Nothing has succeeded because the Kims will never denuclearize, sticks don’t work because of Chinese sabotage, carrots don’t work because of Kim fears of losing political control. China is not the solution. It is a major part of the problem. It is wrong to say that sanctions have not worked. We have not really tested this approach. The one time we got semi-serious, a la Banco Delta, etc., we got the attention of North Korea (and China). Current sanctions fall far short of those on Iran, and in some respects those on Burma and Zimbabwe. And North Korea has always counted on China to bail it out. So what should we do? I am not John Bolton or seeking the GOP nomination. I was an enthusiastic, supporting member of the Clinton Administration team which negotiated the 1994 Accord. I would be willing today to see a verifiable cap on North Korea’s nuclear, missile, and proliferation capabilities if achievable at a acceptable price. But the only way to solve not only the nuclear challenge and the most horrific human rights problem in the world, is through a defacto policy of regime change, or perhaps as one observer put it, “systems change.” Of course, the Kim regime is resilient, but we have never tried very hard, and no one saw the Berlin Wall coming down. And if our pressures don't topple the regime, perhaps they would induce it to genuinely negotiate. And we would bring home the costs to Beijing of its policy, not only American and allied military moves but vastly increased economic expenses. Increased U.S. military presence and joint exercises. Rapid deployment of THAAD and any other relevant missile defense systems. More vigorous efforts to stop North Korean proliferation, including intense pressure on China. Disproportionate retaliation against any North Korea cyber attacks. Truly serious and comprehensive sanctions, including bank moves, a terrorist and any other relevant list, impact on third country business, etc., no matter what strains this causes with Beijing (indeed it might finally get its attention). Major efforts to flood North Korea with information, including greatly increased funding for Radio Free Asia, social media, cassettes, etc. In close concert with our allies, candid talks with the Chinese about the possible fallout of “reunification” (we must use verbal camouflage). I don’t know whether the Chinese have been willing to engage on this taboo topic. In any event, we should seek to allay their concerns: Loose nukes would be secured by the United Nations, not the People’s Liberation Army or the U.S. Army’s 82nd Airborne. A unified Korea would give up nukes. U.S. troops would not deploy any further North and might be reduced. We and our allies would steer refugees toward South Korea and help China with the financial costs. There are major unknown risks in such a policy. I believe they are outweighed by the known coming risks to American and allied national security and the known suffering of the North Korean people. The United States’ current policy toward North Korea is a reflection of frustration with past failures and fantasies born of misplaced hope. Frustration and exhaustion are the yield of years of fruitless negotiations with Pyongyang after the Bush Administration’s retrospectively disastrous trashing of Clinton’s efforts referred to by John Delury. Misplaced hope relates to this frustration and exhaustion and is reflected in the decision to let North Korea—China’s ally and territorial neighbor, after all—be China’s problem: the policy characterized as “strategic patience” of the Obama Administration. The assumption is that the Sino-North Korean Mutual Aid and Cooperation Friendship Treaty mirrors U.S.-style alliance relationships. Misplaced hope weaves our secret dream that the North Korean state will collapse amid cries for democracy or that somehow “the real” western-educated Kim Jong-un will emerge and lead his country down a path of reform and opening despite the brutal evidence to the contrary. Kim Jong-un assumed the title of “marshal,” signaling the formal consolidation of his leadership after the country enshrined its nuclear status in its Constitution—making the threat of an existential threat to the regime from the U.S. and its allies existential. The Six Party Talks as a denuclearization process is among the growing stack of corpses of those executed for their failure to serve the interests of the state. It is clearer than ever before that neither change from within North Korea nor old modes of engaging the regime will achieve the US goal of denuclearization. For a brief moment, it seemed as if South Korea under President Park’s determined leadership could carve a new path toward peace and security on the peninsula by focusing on reunification, a trustpolitik in which through her good offices both China and the U.S. could also be engaged. However, in response to North Korea’s recent provocations, for the first time since the South Korea-North Korea joint industrial park at Kaesong was opened, Seoul unilaterally closed the symbolic facility. Since Park’s ambitious vision is stalled and neither China’s calls to get back to the Six Party table, nor American strategic patience or pleas to Beijing to get Pyongyang in line are working, what should the U.S. do? Sanctions offer a punitive response but not a strategy—they can help create conditions for negotiations or can contribute to but rarely cause internally-driven policy change on the part of the targeted state. One response beyond sanctions seems to be to move toward deploying THAAD, which has a defensive logic but is akin to putting a gated community in a crime-ridden neighborhood. It doesn’t solve the reasons the neighborhood is tough and it makes it harder to work with everyone outside the gates. The U.S. now finds itself in a position where it needs to be both bolder and even more patient, developing a strategy that will have to rest on several factors that the U.S. has so far found difficult to fully accept. First, the U.S. should see North Korea as operating from a position of pathological insecurity and attendant mistrust. Now, however, North Korea is also like the suicidal person on the roof but instead of a gun to the head it is armed with nuclear material—it is in command of the situation. Second, the U.S. should act from the understanding that for many reasons a surgical strike on North Korea’s nuclear facilities carries potential costs that are far too high to rationally entertain. Third, U.S. policy must proceed from the view that achieving the goal of denuclearization given the development of North Korea’s nuclear program is more difficult than ever. These factors add up to the conclusion that, unless we are so committed to waiting for Godot that we are willing to risk more threats to the security of ourselves and our allies, diplomacy is the only option. The U.S. must open bilateral talks with North Korea, while working intimately with South Korea and consulting with China, as well as other stakeholders in the region. Tighter, tougher sanctions and moving toward the deployment of greater strategic assets in the South can generate an environment more conducive to talks. With denuclearization as the goal, negotiations will assuredly be long and tortuous. They may enhance stability and help build trust, and perhaps even help to slow weapons development, but to have any chance of achieving greater outcomes will require putting something Pyongyang wants on the table.